I have been binge painting coastal Maine! I did a number of plein air studies on Casco Bay last August and I was sure that as soon as I arrived home I would start doing some large studio paintings based on my experience and the studies. It didn't happen. I just couldn't work up enthusiasm for them and I thought that was very odd. So I went back to work on my cityscapes. I would often pull out my studies from the summer trip and look at photos I had taken and still NOTHING. Then this January I was suddenly inspired. Perhaps it all had to percolate and my subconscious was continuing to process images? I don't know the answer but whatever enthusiasm I had lacked I have definitely found now! This painting was inspired by one of the very few sunny days we had that week. Most of my studies were done from locations out on the rocks so I became quite familiar with them. What I found so enticing about working there was the hypnotic lapping of the tide as it came in and out as well as the cool breezes and enticing smells of seaweed and salt water. Every so often there would be strange ripples moving across the surface of the water which was clear enough to reveal the seals below that were creating the disturbance. Painting this piece took me back to that peaceful, inspiring time. I hope to be posting more coastal paintings here and I hope you will continue joining in the journey! I was very honored today that "CASCO BAY COTTAGE" (see last post entry) was awarded second place at the annual awards banquet of the WASHINGTON SOCIETY OF LANDSCAPE PAINTERS held at the ARTS CLUB OF WASHINGTON DC. I have a great deal of respect for the talent in that organization and I am proud to be a juried member of it! Opening April 6th and running to April 30th, "SPRING MIX" at the PENINSULA GALLERY in Lewes Delaware. This is a group show of floral and garden paintings by the Washington Society of Landscape Painters. You can visit the WSLP website www.wslp.org to see all the wonderful paintings in this show. 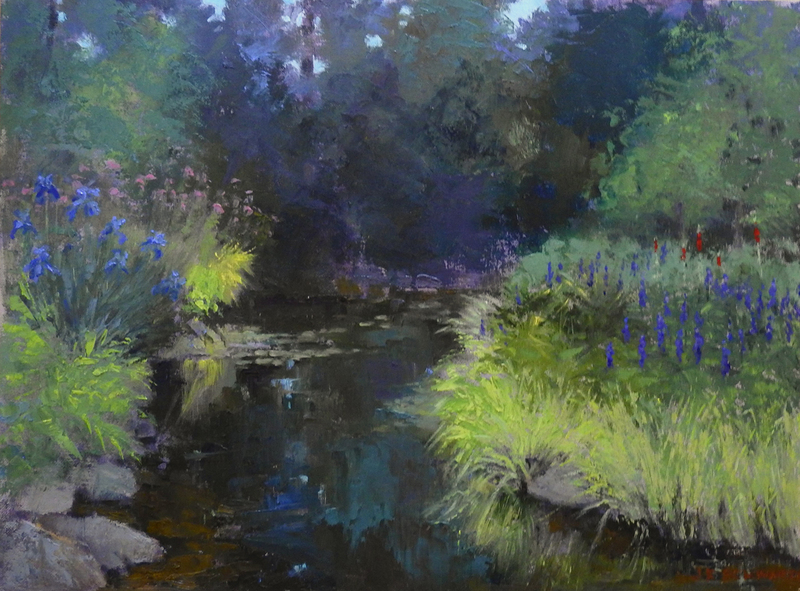 Below is an image of the painting I submitted which is a corner of the water garden at the Maine Botanical Gardens, part of the Garden of the Five Senses. Like my last post, this painting was developed from sketches and photo references created last August on Casco Bay in Maine. Most of the week was cloudy, foggy and rainy providing some interesting images but when the sun came out it was truly glorious! One morning I awoke to golden sunlight and knowing how quickly the weather can change on the Bay I didn't waste any time heading down to the dock before 7:00 AM. to document the sunrise. The cottage depicted here was next door to the one I was staying in and looks directly out over the Bay. However, what struck me on that morning was the light hitting the rocks and dappling the path to the cottage. It was an opportunity to paint a variety of textures as well as the strong contrast of warm and cool colors and light and dark areas. The tools I used were the same as in my previous post "The Cove at Anna's". For this one I painted on a linen panel which I had toned with yellow ochre. I used a two inch bristle brush, palette knives and round bristle brushes. If you don't often use the latter I recommend you give them a try. "Spring Mix" A group exhibit by the Washington Society of Landscape Painters at the Peninsula Gallery in Lewes Delaware. April 6th through April 30th. March 28th to 30th painting the Gardens at Winterthur in Delaware. I hope to have some interesting work to post from that experience! 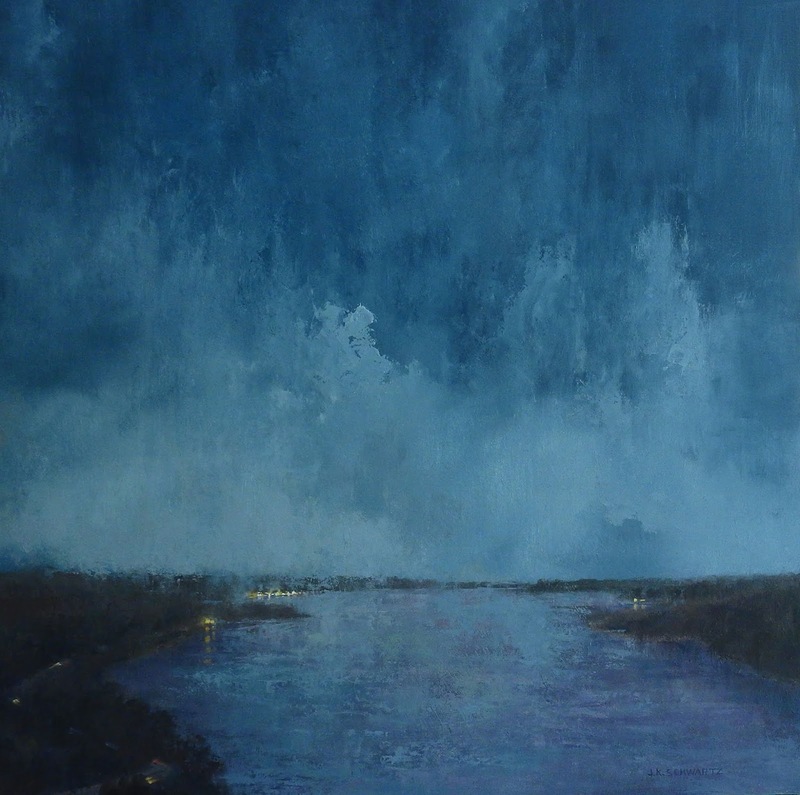 I never tire of painting or viewing nocturnes. Every time I paint one I try to explore new colors of the night as well as how to apply the paint to give the sense of depth that is found in the night sky. A flat application of paint doesn't cut it for me. This particular painting was created with three tools. A two inch bristle brush, a round nose palette knife (bulk of the painting) and a #4 round bristle brush. 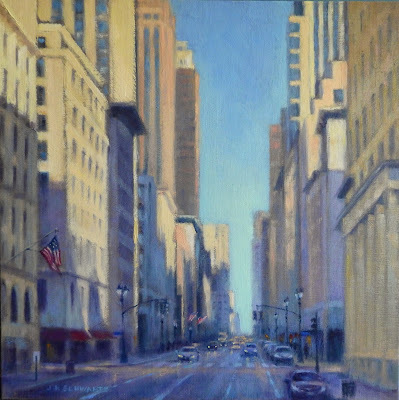 I kept the palette simple and all colors were mixed from indigo blue, cerulean, ultramarine blue, alizarin crimson, vermilion, naples yellow, ochre and white. 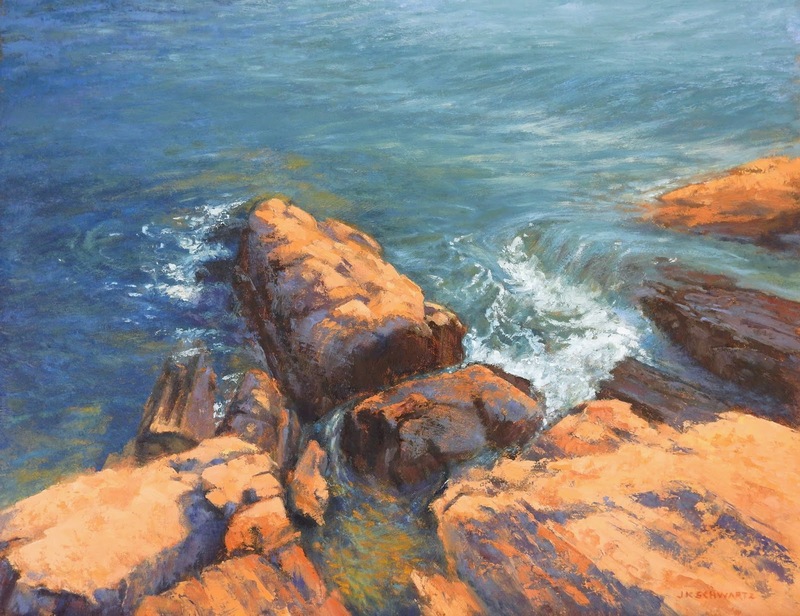 The inspiration for the painting was the cove at Anna's Waterfront restaurant on Casco Bay in Maine. I had enjoyed a wonderful lobster dinner at the restaurant with friends and when it was time to leave we were greeted with this wonderful, peaceful, full moon night. I eliminated the cars in the parking lot and the flagpole to simplify the image and focus on the quiet roll of the tide, the sources of light in that velvety sky and the reflections on the Bay. I didn't need a photo reference for this one. It was painted from the heart. "Spring Mix" at the Peninsula Gallery, Lewes Delaware. April 6th through 29th. This is a Washington Society of Landscape Painters group show with a floral or garden theme.